Over the course of the last 20 years the Kentucky Folklife Program has collaborated with both National and State Parks on various projects and presentations and beginning this summer, KFP’s relationship with the parks will take a new form. Kentucky Folklife Program Director, Brent Björkman and Traditional Art Indiana Director, Jon Kay have been awarded the 2013 Archie Green Fellowship from the American Folklife Center at the Library of Congress. This fellowship is awarded each year to select projects dedicated to occupational folklore research. Brent and Jon’s project, Ranger Lore: The Occupational Folklife of Parks will focus on the lives and work of National and State Park rangers in Indiana and Kentucky. 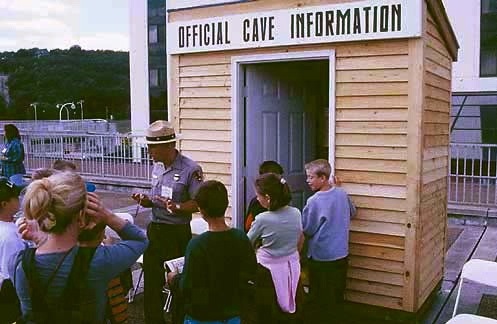 Brent will be doing ethnographic and oral history fieldwork , interviewing current and previous park rangers at Mammoth Cave National Park in Kentucky. WKU Folk Studies Department and Kentucky Folklife Program have an ongoing relationship with MCNP and this is an opportunity to enhance that relationship and delve deeper into the lore of life as a park ranger at Kentucky’s National Park. The project is well-timed as both the National Park Service (NPS) and Indiana State Parks & Reservoirs system will celebrate their Centennials in 2016 and this project will document the ever-changing occupational story of our nation’s park rangers. You can read the WKU press release about the project and then visit Traditional Art Indiana’s website to learn more about Brent’s collaborator on this project, Jon Kay. Continue to check back here for updates and insight into Brent’s fieldwork as the project progresses!